Welcome to a new year! If your’s started anything like mine, it was not as planned. Just before midnight, my wife and I had the opportunity to clean up after a sick kid. But you know what – it didn’t ruin our evening, and I would contribute that in large part to her but also to some established guidelines we have in our home. These are a work in progress for us, and I hope they will be for you, too. 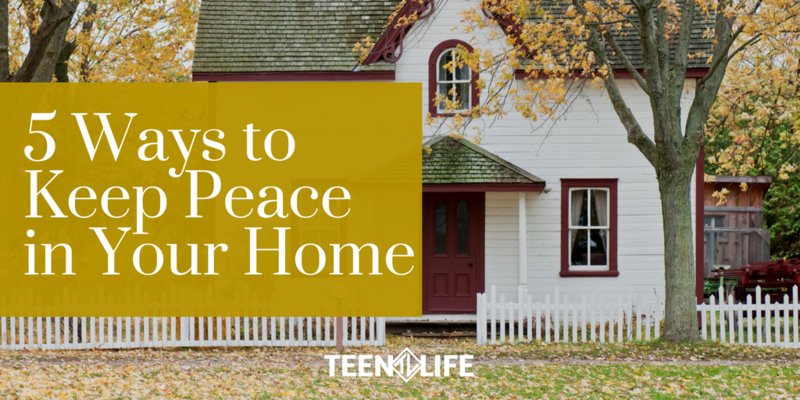 Whether you apply this as a parent, youth minister, teacher or counselor, I believe this list can help you literally keep the peace. I want to do things a little backwards in this post. Most of the time you would wait until the end for a bonus, but I’m going to give you the bonus first. The list below works best in the context of some other established “house rules”. The one I believe has had the most influence in our home is that we don’t talk about what could have been. What I mean is that we don’t ever bring up, “Well if we had not decided that, or if this person wasn’t here, or if we had done this my way, everything would be okay.” This is bonus because without house rules (some would say family values) any other rules you try to enforce will be met with significant resistance or worse confusion. Establishing what your family, classroom, youth group, etc., hold as their standards will allow you to have conversations about how that can best play out for all of you. 1. Create a plan when things are calm– This seems so simple and may even feel like something you hear all the time, but have you actually followed through and done it? My guess is probably not. If you have, great! Then you have a chance to revisit the steps you have in place or the plan for handling difficult situations. If you need to establish a process, plan or put steps in place, then schedule a time to get it done. This is one of those things that can feel like, yeah we will get to it. But you won’t. You have to prioritize it by setting aside the time. 2. Involve your teen (child) at home– I don’t mean the process of creating a plan, that should be a given. Involving your child at home means having chores they are expected to do. It means including them in family decisions and asking for their input about how things are going. Then, you need to be willing to implement ideas they have for making things better. 3. Follow through – There are a miriade of reasons this is important. As a parent, your follow through is important to help your kids build trust with you. That applies to everything from discipline to showing up at school activities to expecting them to do their chores. Of all the things on the list, this may be the hardest for me with young kids, but the best way I have found to be more effective is to be very careful with what I say I am going to do and very intentional with what I do say. 4. Don’t treat everyone the same (and talk about why) – A real struggle as a parent or youth worker is the tension of treating everyone equally but not the same. Each person is different. Because that is true, it’s so important not to treat them as if they are not. This is especially hard for parents of multiple kids. To be aware enough to handle situations with each kid differently is a significant task on top of everything else. As your kids grow, the importance of independence and connection will collide. As the adult, it is essential to continually work on how this is happens with the teens and kids you interact with but it is worth all the effort you put into it. 5. Be creative, you’re the adult– There is no parenting manual. This can be a tough thing, but it can also be good. You know your kids best and only you can truly come up with the best way to teach and train them. In my opinion, the key here comes in the posture you have as the adult. Recognizing this is a long term process, like 18-24 years, is necessary to keep things in perspective. With that mindset, you can approach more situations age appropriately and with more empathy and grace. Each and every situation is potentially a teachable moment but is not dependent on the child’s ability to absorb the lessons, but rather your ability to communicate it clearly…again. You may feel or say you have tried everything but you haven’t. Try something that seems ridiculous and unrelated. You may be pleasantly surprised by the connection your teen can make to the lesson they need to learn. Obviously, this is not a prescription or exhaustive list. I would recommend looking at books and blogs from Mark Matlock, Kevin Leman, Michelle Borba, and Daniel Siegel to keep your thoughts fresh and continue exploring how you can be the most effective adult influence in the lives of teens you encounter.